On April 12th, Khloé Kardashian and beau Tristan Thompson welcomed little baby True to the family. Since then, fans have since been spoiled with adorable baby pics on Kardashian’s Instagram (which we can’t get enough of). But this week, mama Kardashian took a break from sharing baby pics to post a video showing off a dazzling new diamond ring in honor of True. On July 18th, Kardashian debuted rose gold and diamond “True” ring on her Instagram Story. She tagged best friend Malika Haqq to signify that the ring was a gift. Since the Carrie Bradshaw necklace came back into fashion a few years ago, monogram and nameplate jewelry of all styles has become super popular — and the Kardashian tribe is rocking the look. Sister Kylie Jenner, who gave birth to her daughter Stormi in February, has been spotted wearing a simple gold “S”pendant on a dainty chain. And the love of bling runs strong in this family. Little True already has her ears pierced and has flaunted some stunning diamond studs, as seen in her mama’s Instagram videos. We’re adoring every bit of True Thompson we can get (that diamond ring included). 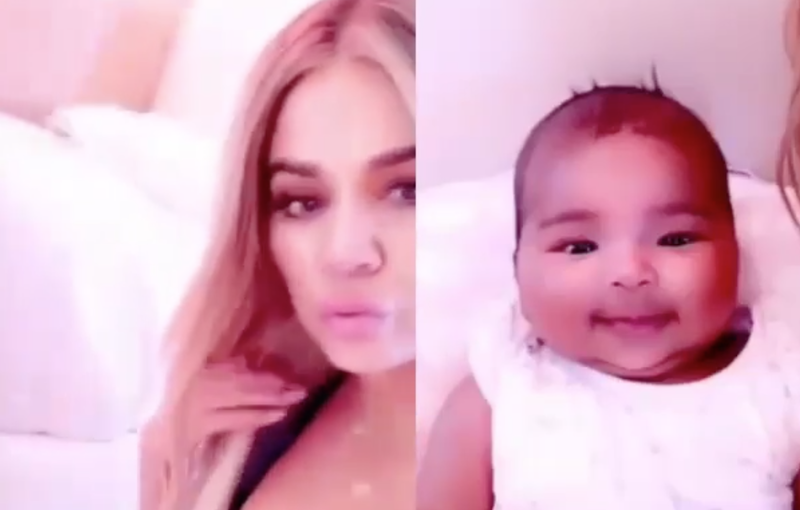 Keep the baby pics coming, please, Khloé!